BirminghamLive is pleased to unveil its 30 Under 30 line up for 2019. These are 30 of the most enterprising and inspiring young people currently living, working and making a difference across the city region. 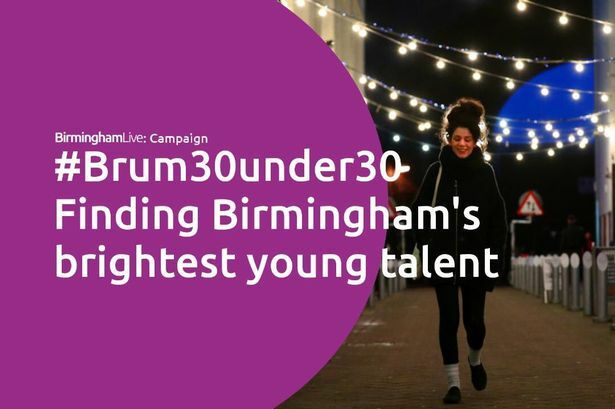 The 30 Under 30 campaign was launched last year with the aim of showcasing those young people who can inspire others to do great things in Birmingham and this year&apos;s cohort is no different. We have again partnered with The Prince&apos;s Trust and Citizen UK to highlight some of those faces making a difference. The list was compiled from nominations submitted to BirminghamLive by our readers. Read their short bios below and we will be profiling them in more detail on BirminghamLive over the coming weeks - and you can read about last year&apos;s 30 Under 30 here. Aditya is the founder of Birmingham-based eyewear label Josh Fano which seeks to use modern design as a means to fight global blindness. He formed a partnership with charity Sightsavers to fund one sight-saving surgery for every ten pairs of glasses sold in order to combat the issue of curable blindness in the third-world. Alex was diagnosed with Asperger&apos;s aged ten and now presents talks on the condition at universities, corporations and schools and also writes articles and appears on radio and TV. He has launched a campaign aimed at enhancing the experience of autistic people at football matches, in addition to fundraising, volunteer work and writing a book about his life. Amna is the co-founder of GirlDreamer whose mission is to educate, elevate and empower the next generation of women of colour. She started a longboarding crew called Boarders Without Borders to use sport as a tool for social change. She also founded and runs her own fashion label Almari by Amna, having worked her way through the business and fashion world with no formal training or a degree. Amy is a master of architecture student and activist for inclusive building design. Her research and work in practice focuses on providing decent accommodation for the elderly and disabled. She was inspired after being struck down by a rare illness called Mast Cell Activation Syndrome part way through her masters in 2015 and campaigns for design professionals to understand their responsibilities. Anna is the manager of Greater Birmingham Chamber&apos;s Future Faces arm, championing young professionals across the city, and has overseen a remarkable rise in its reach and membership. She also lobbies on local business policy, represents the city, including recently at Westminster, and pushes for greater inclusivity at Future Faces and the chamber. Ashley is the senior assistant police and crime commissioner in the West Midlands and has played a huge part in transforming the force&apos;s stop and search policy. He produced a schools workshop that explained and broke down barriers about stop and search for young people and works with West Midlands Police to reduce the number of people unnecessarily stopped yet improving the arrest rate. Cleo is the founder of food delivery website Mydine which specialises in healthy, Caribbean meals. The company went from serving hundreds of customers across Birmingham to supplying thousands of meals across the country in under 18 months. She also spends time giving meals to the homeless alongside running all aspects of her business including cooking and hand delivery. Danny founded the House of Allure dance company which promotes confidence and fitness through burlesque-based classes and performances. He helps students gain confidence and perform in shows as well as take part in the Birmingham Pride parade. He started Birmingham City University&apos;s Burlesque Society while studying illustration and illustrated children&apos;s books and has won many accolades. Fran is a University of Birmingham economics student and netball sports scholar, representing a demanding life as a student and elite-level athlete. She plays for local Superleague senior team Wasps, England Roses senior squad and the university&apos;s netball first team. She is also a regular guest on The Netball Show podcast. Henrietta is the director of policy and strategic relationships at Greater Birmingham Chamber and plays a key role in championing business in the city, working closely with senior business figures, the mayor&apos;s office, combined authority and council. She leads a team of five people and manages a budget in excess of £500,000, responsible for key relationships with businesses such as HSBC and JLR. Hezron&apos;s body was badly burned after he fell into a bath of boiling water aged five which led to him being bullied at school. At 13, he became homeless and later entered into a gang and criminal activity. With help from The Prince&apos;s Trust, family and friends, he has turned his life around and now mentors young people across the city. Harriet has been a wheelchair user since 2014 after a car hit her and a friend at a bus stop at 100mph, killing her friend. She now blogs about disability issues and is a volunteer with the British Red Cross and other organisations to support disabled people in Birmingham. Joshua, known by his stage name RTkal, is a rapper and co-founder of IDST Music Studio and Beats and Barriers Academy. He has already enjoyed some chart success and performed at festivals including Glastonbury and Bestival. In 2018, he co-created IDST Music Studio and Beats and Barriers Academy, offering music education and recording facilities to youths and under privileged groups in Birmingham. Kadar is an elite track and road runner who represents Birchfield Harriers and won the 2018 Great Birmingham Run half marathon. He was only 13 when his father was killed, forcing him to flee his home in Ethiopia and grow up in a Kenyan refugee camp. He competed at the 2017 World Athletics Championships in London alongside his hero Mo Farah. Katie is the founder and director of Altruist Enterprises which provides stress management and mental health awareness training to organisations and schools nationally. She started the company aged 19 following personal experience of mental ill health and delivers workshops to Birmingham schools and clients such as IKEA and West Midlands Fire Service. Kiran is the co-founder of GirlDreamer which she launched with fellow 30 Under 30 inductee Amna Akhtar. She has supported more than 750 young women of colour directly in Birmingham through leadership development programmes in schools and created multiple community initiatives that have led to improved social inclusion and social action among young women. Kirsty is a volunteer and advocate for women&apos;s reproductive and mental health with charity Cysters. She writes blog posts on behalf of the charity as she suffers from polycystic ovary syndrome. She is also an author of two teen fiction books, a blogger and founder of data news website The Briti. Kishan is a DJ, music producer and campaigner on mental health. He co-founded New Street Records in 2015 which is a student-led label with the aim of giving student volunteers a career springboard and work experience in the music industry. He fits all of this in alongside his medical degree at the University of Birmingham. Mari is an 800m runner who has represented Team GB, including at the recent European Indoor Athletics Championships in Glasgow where she came fifth. She is currently juggling a demanding training schedule with her fourth year of biochemistry studies at the University of Birmingham where she is a sport scholar. Mark has many strings to his bow. When he isn&apos;t doing his day job as a bridge engineer, he is leading the Future Faces business networking group as its president or selling his sketches to generate funds for charity. He is also an ambassador for STEM education projects including at the University of Birmingham. Meera is the policy advisor to West Midlands Mayor Andy Street and works with the Conservative party to campaign for more female and BAME candidates in politics. She engineered the first ever Mayor and Faith Conference, founded Diwali on the Square, is leading on the Inclusive Leaders&apos; Pledge and designed the Mayor&apos;s Community Weekend. Mikayla is involved in a host of organisations across the city alongside her job as national campaigns and engagement manager at the Birmingham office of Uprising, the national charity focused on youth leadership development. She supports, among others, Enrol Yourself, Birmingham Civic Society, West Midlands Women&apos;s Voice and TEDxYouth@Brum. Nicole is the founder of Grow Mama, a networking group for working mothers in Birmingham. She was inspired to launch the initiative after becoming a mother herself and finding plenty of networking and support for senior businesswomen with children but not for those earlier on in their careers. She is also a co-ordinator for the Red Box Project, providing free period products to local schools. Omran is a Syrian refugee turned entrepreneur who also supports graduates in the city as they embark on their own careers alongside extensive volunteer work. He founded Gladington, a service which brings students together with entrepreneurs and businesses, and is a director at creative agency Bloomup which supports start-ups and entrepreneurs. Reena is the co-founder of Green Sisters which provides healthy, vegan, gluten free and allergen friendly foods. The company strives to cater for all people, no matter their dietary requirements. Her passion for creating food for all came from her childhood after her family discovered dietary limitations through personal experiences with coeliac disease, diabetes, inflammatory bowel disease and more. Romanah is the co-founder and director of Eloquent Praise and Empowerment Dance Company, which she opened in 2014, as well as being a qualified primary school teacher. Alongside teaching dance classes, she mentors attendees and has won global awards for the school. Shuranjeet is the founder of TarakĪ, a campaign which aims to remove the stigma surrounding mental health among people in the Punjabi community. He was inspired to launch the initiative following his own experiences of mental ill health at university and now manages multiple projects seeking to change Punjabi and broader South Asian perceptions on mental health. Talisha is an author, TV presenter, BBC Three researcher, keynote speaker and founder of Skool Girl Online. The lifestyle platform is aimed at young women where she champions business startups and personal development through original content posted on the site. She started self-publishing children&apos;s books at the age of 16 and was dubbed a ‘Black History Month Hero&apos; by Birmingham primary schools. Tanya raises funds and awareness about endometriosis, a condition where tissue similar to the lining of the womb starts to grow in other places such as the ovaries and fallopian tubes. She does this via online campaigns and an annual charity gala which is being held in Solihull in May. Tanya also runs multiple toastmaster groups to help people with public speaking and leadership skills. Zeddie is the head of community at Free Radical, part of the Beatfreeks group, and also a theatre maker, writer and co-curator of TEDxYouth@Brum. She helped to write two Brum Youth Trends reports which gave insights into what young people in Birmingham think, want and need. She also created an event called HEADSPVCE with young people for mental health and wellbeing, led Poetry Jam and is co-curator for TEDxYouth@Brum this year.